The Wall Street Journal offers a look at sites that offer free software tools for managing a business and gives a shoutout to Backpack. Backpack helps small businesses, agencies and entrepreneurs keep and track to-do lists, notes and other documents, discussions and schedules all in one spot. Writeboard and Backpack "make group projects both fun and productive"
"Writeboard: Class projects reinvented" describes how the author used Writeboard and Backpack for a team project at Florida Tech. 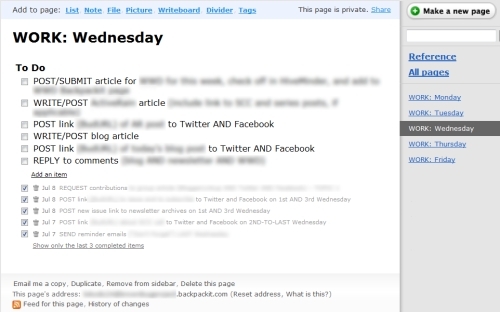 Writeboard does support simple text formatting, e.g. asterisk around a word make it bold (*example*). I actually discovered the formatting by accident, because it is just natural to give emphasis to text like that. It also saves every version of our file, so we could easily see what we’d done before or what someone else changed. We all signed in with a simple password; no new accounts for every student to setup. Everyone in my class found it equally easy to use, and we had a vibrant community helping each other with class notes and the group project. Altogether we had over 4,000 words in one Writeboard; not necessarily recommended, but it shows the power of Writeboard! The tech is so easy to use, everyone enjoyed it. And the important thing is that it actually helped us achieve our goals in ways no other tool had ever done. Even though we techies love new features and tools, the truth is that when something needs to be done, just getting it done is sometimes better! One other tool that helped our team out was my Backpack account. This great tool, which I hope to write about more in the near future, lets you store lists, notes, links (including Writeboards), and more on easy-to-edit pages. For our class, I made a public page where I put a link to our team’s Writeboard, notes with important deadlines and information about the project, and lists of assignments and participants. It just tied everything in the class together easily and quickly. No starting a new website, designing HTML/CSS, or anything, just getting the job done. I can’t wait to try this out in my next class group project again. If technology can make group projects both fun and productive, that’s really something! So next time you’re in a group project, give Writeboard and Backpack a try; your team might get more done (and a better grade) too! 37signals tools top the list at "100 Apps for Tech–Savvy Teachers"
Rasmussen College published an article called 100 Apps for Tech–Savvy Teachers. 37signals tools are #1 on the list. 1) 37signals: More than three million people use this application for a reason — it’s extremely effective for businesses and educators. 37 Signals makes it easier to collaborate, share, discuss and get work done through its programs — Basecamp (a project management system), Highrise (where you can track your contact with parents and students), Backpack (where you can organize your life) and Campfire (an instant messaging system). Frugal IT: Backpack filled with "real-life usefulness and smooth interfacing"
In HOW TO: Plan a DIY Wedding Using Social Media, a Mashable editor open sources his wedding planning work-flow and shares the tricks he's learned so far. One of his recommended tools: Backpack. It should be clear by now: planning a wedding is a mammoth undertaking (and ours is relatively small at just over 100 guests). Keeping track of all the details can be difficult, but two tools are potentially invaluable for staying organized as the list of items you need to keep straight for the wedding grows larger. One of those resources is Backpack. Though initially designed for business use, Backpack is a single-page, wiki-style organizer that can be amazingly useful for keeping track of who is doing what, what is left to do, and what has already been accomplished. Because Backpack pages can be shared, you can also use the app to get your wedding party involved — dole out tasks to bridesmaids, groomsmen, and relatives and keep track of everyone’s progress. Read the full piece for more recommended tools. Why the Backpack Journal is "killer"
I'm going back to Backpack for workflow management. The web interface is fantastic (and familiar), I can easily email in material, create seperate pages, feel secure, integrate easily with GMail, Google Calendar and be completely web-based. I'm using it for product management, status updates to myself and as a "private twitter" etc. It's like the anti-social bookmarketing site Pinboard for micro-messaging. The article also raves about Satchel, which brings Backpack to your iPhone. Yes, [Satchel] costs $10, but it's well worth the price. Satchel is speedy, works "offline" (whatever that means anymore), and intuitive. I can also easily update my Journal through Satchel. Plus, there are hacks and apps for getting Backpack to work well as a web app (like GMail) on the iPhone if preferred. I have a page set up for each day of the workweek, and I evenly distribute the action tasks for all of my marketing tactics throughout the week. 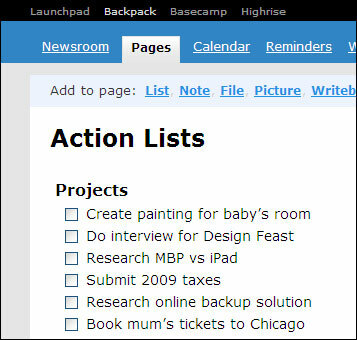 On a given day, I simply click on that day’s page and get to work on the tasks, which are within a handy checklist (see image above along the left). As I complete the items, I check them off. My goal is to get through the entire list on any given day. If I don’t get through the list for some reason, my rule is to get through all of the week’s tasks before the following Monday. This provides me with a little flexibility without letting me completely off the hook or allowing me to get too lax with my efforts (thus, adding consistency). Each Monday, I un-check all the lists on every page, which helps me to stay accountable to my plans and goals for my business. I can clearly see what got done and what did not get done over the previous week. After un-checking the items, I’m ready to begin another week.